9 1/2" x 10 1/4"
Keep your mid-size log sheets in a clean and pleasing condition with the 2-in-1 attractive and durable binder. The 11730 maintains (8-1/2" x 8-7/") log sheets organized neatly. The sheet divider provides a hard surface for writing and prevents image transfer to forms below; on inside front cover, spine, and back cover. 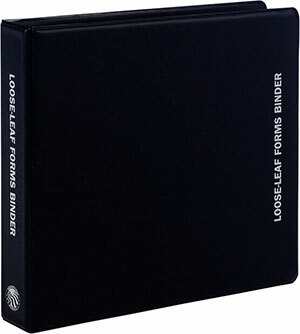 Binder measures 9-1/2" x 10-1/4"; x 1-1/2" (spine); black finish with white lettering "Loose-Leaf Forms Binder". White lettering, says "Loose-Leaf Forms Binder"
Dimensions: 9-1/2" x 10-1/4" x 1-1/2"